Today will be my last Ag Book of the Day post…until I decide to do it again! (That’s my perogative, as author, since this blog is about the only place that I have control! LOL!) I tried to feature an agriculture-based children’s book every day that the boys had school in April. It coincided with their April Reading Month theme of Cultivating Reading. It was a fun month, and I loved some of the new books that I was made aware of, plus I’ve found a few others that I really can’t wait to add to my collection. And it was such a popular theme, that I’m sure I’ll do a week here or there, as I find new books to add to our collection. Since I missed a few days, due to George’s little break he decided we needed, I’m going to feature three books today. Enjoy! 1) “The Life and Times of Corn” by Charles Micucci. With corn being such a big newsmaker lately, I wonder how many kids actually understand what it’s all about? This book goes into the actual history of corn, and how it’s used today. It gets great reviews, and I can’t wait to add it to our collection! 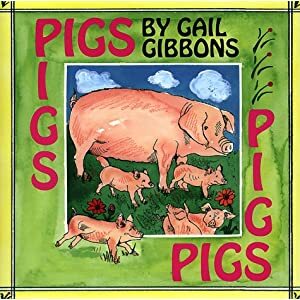 2) “Pigs” by Gail Gibbons. Who can live without a book about pigs? And I LOVE the illustrations! 3) “How Do Apples Grow?” by Betsy Maestro. Probably for an older child, at least first grade or so. But when you’ve been asked a million times how or why we have apples, this book is a GREAT tool! Goes through each step and the seasons of a tree. Love it! This entry was posted in Ag Books, Agvocacy, Farm life, Reading, School work and tagged Ag Book of the Day, agvocacy, children, farm questions by wagfarms. Bookmark the permalink. Gail Gibbons is a really great author – she writes so many books about ag!! I’ll have to look through the rest of the books you posted about!